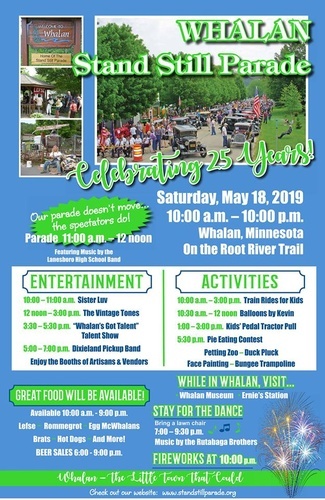 Celebrating its 25th Anniversary, the Stand Still Parade will include additional events and activities in 2019, including a street dance, a kids pedal tractor pull, additional games for children, “Whalan’s Got Talent” and fireworks. Proceeds are going to the new city hall roof fund. Parade is from 11:00am-12 noon. Whether you are touring southeastern Minnesota's beautiful bluff country or enjoying a bike ride on the Root River State Bike Trail stop in! Enjoy artists, crafters and demonstrators, live music, good food and games for all ages. You can also visit the petting zoo with baby farm animals or sit back and enjoy the live music and fresh made lefse and other treats! The parade began with the intention of promoting community involvement and just plain good old family fun. Since the town is too small for a parade to move it was decided the parade would stand still and the spectators would do the moving. The color guard and American Legion members are always seated at the beginning of the parade, with all other units following. The units are placed on each side of the street as well as down the center. Floats and units are parked and musicians perform while standing in place. The parade stands still for one hour. 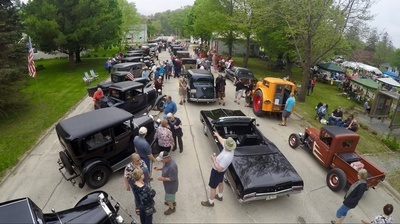 During the day there is live entertainment, food provided by the local church, and artists demonstrating and selling art, children’s activities and contests.